Bak Chor Mee, a much loved noodle dish found in hawker centres all around Singapore, is a singularly Singaporean fare. So this post is for, and dedicated to, all my fellow Singaporeans, who, like me, are no longer living “at home”. There are noodles a-plenty, of course, all over East and South East Asia, but the way Bak Chor Mee is prepared and served, with its stewed mushrooms and various toppings, is pretty unique amongst its brethren! In Hokkien, Bak Chor Mee basically means minced meat noodles, the word bak in Hokkien, as I understood it, growing up in Singapore, referred to meat, but particularly, pork. 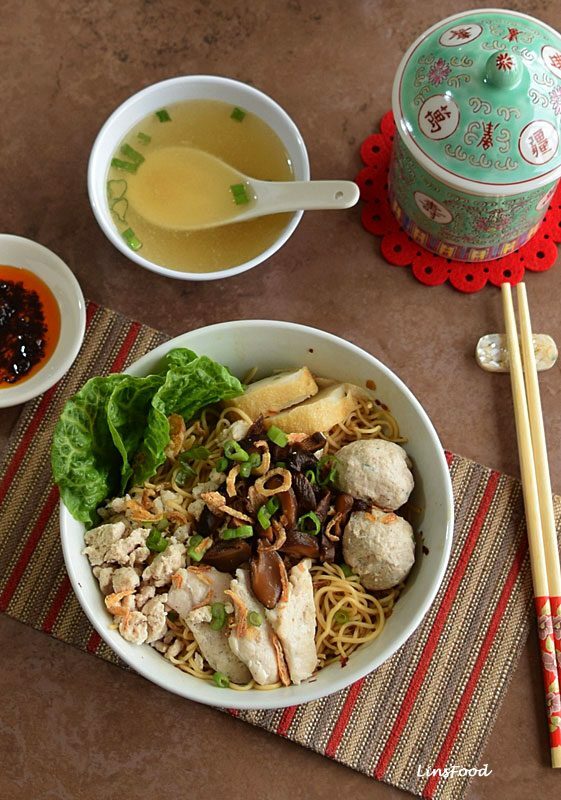 Ask a handful of Singaporean Chinese what their favourite way of eating Bak Chor Mee is, and chances are, you’ll get a few different answers. Different noodles, different toppings, with soup or no soup, spicy or not, and that’s probably only half of it! My favourite Bak Chor Mee is this: thin yellow egg noodles, known as Mee Kia, lots of chilly, soupy, meatballs, fishballs and crispy fried shallots. I have to be honest, the recipe does takes a little bit of an effort; call it a labour of love. There are a few parts to it: the stewed mushrooms, the soup, the meat, which needs marinating and cooking, the sauce and the garnishes. However, you can make life easier by marinating the meat and soaking the mushrooms the night before. I admit it, the first time I ever made it, over 20 years ago, living alone in London, it took me 4 and a half hours! Almost as long as my London marathon time! Don’t panic, I did also make the fishballs and meatballs from scratch at the same time! To set your mind at ease, these days, actual hands on time for me is only about 30 – 45 minutes. 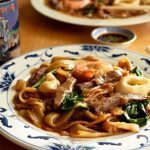 In my recipe, you’ll find that I’m giving you the option of making a pork based Bak Chor Mee, as is traditional, or a chicken based one. 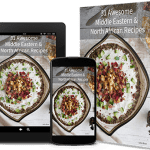 The reason for this is that I have many readers from all over who observe kosher rules or who are Muslims. And I know they would just love to try this recipe! 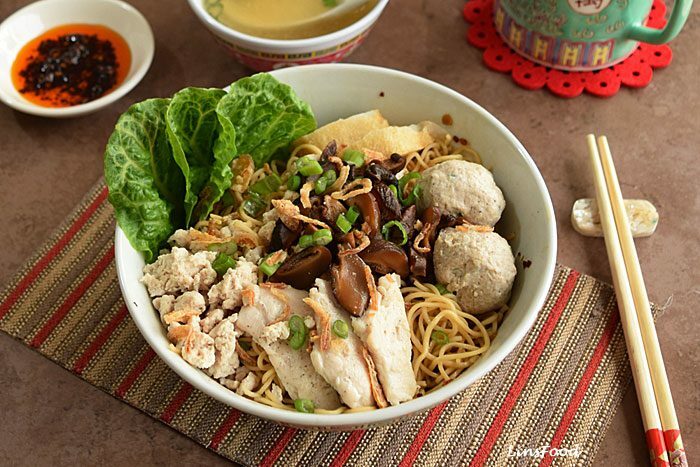 Only on LinsFood: Kosher Bak Chor Mee and Halal Bak Chor Mee! We marinate all the meat we will be cooking overnight. I’m feeling greedy, so I’ve gone for the whole lot: mince, meat slices and liver. You can do all three or just go for one or two. We soak the mushrooms overnight, then cook them for an hour the next day. Next Day: We make the soup from scratch by boiling the meat bones for just over and hour, with some aromatics. We make the sauce for the noodles with some homemade or shop bought sambal paste, liquid from the mushrooms, some soup and a few other ingredients. This takes 2 minutes. We blanch the noodles and beansprouts. At the same time, we cook the meatballs and fishballs in the soup. We cook the mince, liver and meat slices in the same soup while the balls are cooking. 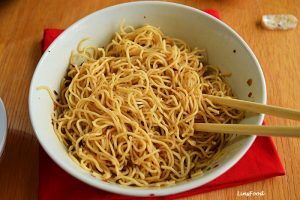 We mix the sauce, noodles and beansprouts in individual bowls. Top with all the meat and the balls. Ladle some soup over (optional). Top with stewed mushrooms and liquid. As mentioned, the mushrooms and meat can be soaked and marinated the night before. The soup can also be made the day before, and reheated before you start to assemble. If you are using dried noodles, always follow packet instructions for serving and cooking times as they can vary. A rough guide though would be 75 g (2⅔ oz) per person of dried weight for egg noodles, to be cooked for 4 minutes. Fresh noodles – about twice the weight and they only need about a minute of cooking time. 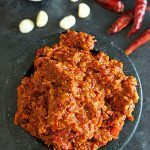 Sambal or Chinese Chilli Oil – to begin with, let’s make life easy and go for shop bought. 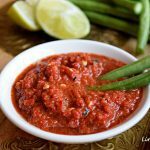 Any sambal will do: sambal tumis, sambal oelek or any Chinese chilli oil. 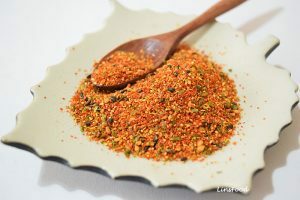 I use this sambal paste or a Chinese chilli oil with its bits, as I always have some in the fridge. Again, get them from an Oriental store if you can. If you can’t, make it days before and freeze, to make life easy on the day. Then thaw for an hour before cooking as in the recipe. My meatballs recipe is here. 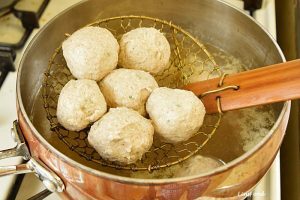 Fishballs – coming soon! Crispy Fried Lard – same again. But if you want to make it, just get some pork belly, cut it up into little cubes, dry well and fry for a couple of minutes, with no added fat, on medium heat, until crispy and golden brown. Drain and set aside. 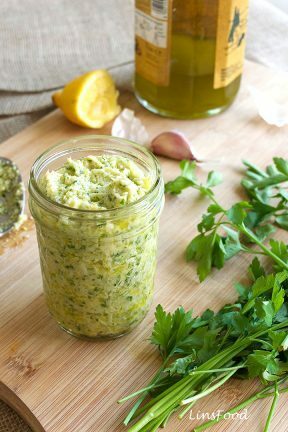 The lard pieces and fat can be stored for weeks in a clean jar. Crispy Fried Shallots – here’s my recipe if you fancy homemade. But these should be found easily in Oriental stores. 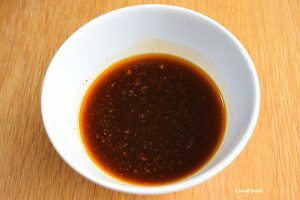 Dark and Light Soy sauce – click here to read more about the different types of soy sauces. 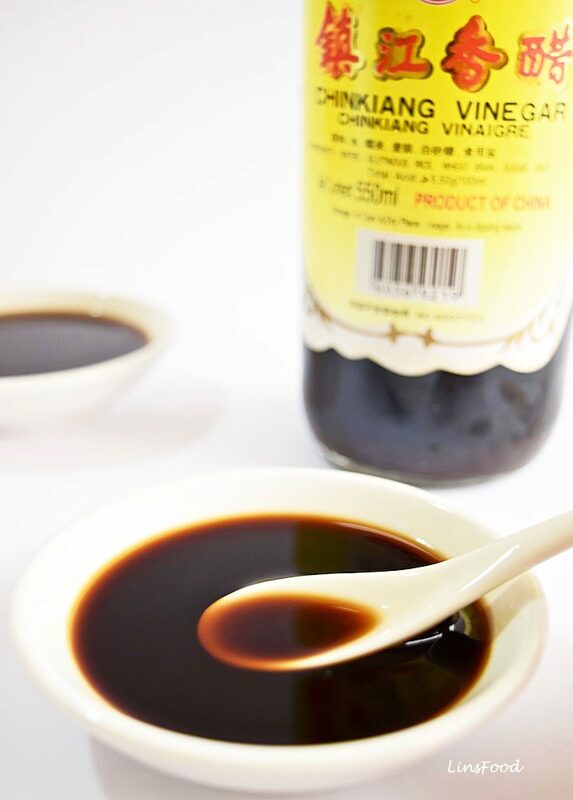 Chinese Black Vinegar is, as its name, suggests, a very, very dark vinegar. 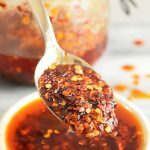 It is also quite commonly known as Chinkiang vinegar and has a very deep character, is a touch smoky with hints of sweetness right at the back of it all. Click here to read more about it and for how to substitute it. That’s about it. Now, the only thing that’s left to do, is the cooking itself! 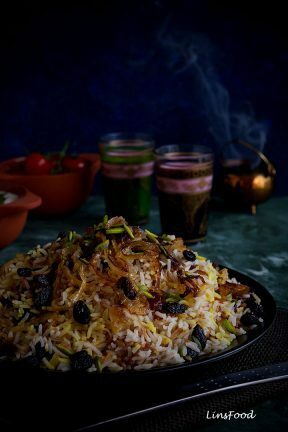 Rice is always good with this, as is any fresh bread. Or potatoes! 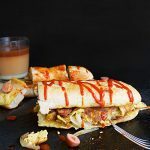 Have fun folks, and if you are/were from Singapore, I know you’ll be jumping for joy with this recipe. If this is new to you but you love noodles, I hope you’ll come to love Bak Chor Mee as much I do! 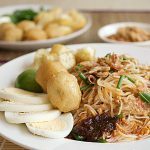 Bak Chor Mee recipe, a much loved noodle dish found in hawker centres all around Singapore, is a singularly Singaporean fare. Place the mushrooms in a large bowl with the hot water. Cool to room temperature, cover with clingfilm and place in the fridge overnight. Marinate the mince, meat slices and the liver in 3 separate bowls, cover with clingfilm and place in the fridge overnight. 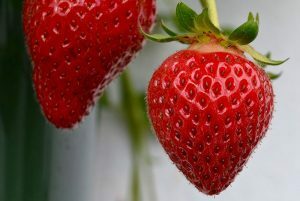 Place the water, meat bones, spring onions (scallions), black peppercorns, star anise petal and salt in a stockpot or large saucepan and bring to boil. Lower the heat right down and simmer for 1 hour, removing any scum that surfaces. At the end of the hour, drop the dried anchovies in, stir and simmer for 15 minutes. Take off the heat and strain into a clean saucepan and leave to simmer at the lowest heat on the saucepan if you're ready to serve the bak chor mee. If not, keep it aside and reheat when needed. As soon as you're done starting the soup, move on to the mushrooms. 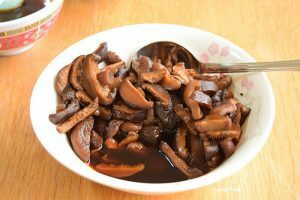 Place the mushrooms and its soaking liquid in a saucepan and add all the other ingredients: 1 Tbsp dark soy sauce, 1 Tbsp fish sauce, 1 tsp black vinegar and 1 tsp sugar. Bring to boil, then lower heat right down and simmer for 1 hour. When done, pour into a clean bowl, leaving any sediment behind. Make sure your soup is simmering away. Bring a medium saucepan of water to boil and cook the noodles in the simmering water following the packet instructions. Dried egg noodles will usually take about 4 minutes but each brand will be different. If you have fresh noodles, this will only take about 1 minute. Drop the beansprouts in with the noodles in the last 30 seconds, just to scald. Drain and set aside. It's best to prepare each bowl at a time, moving forward. 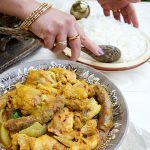 Divide the minced meat, meat slices and liver into 4 small bowls and top with a generous ladle of the simmering soup, stirring slightly to break up the minced pork/chicken. Set aside. This step will semi cook the meat. Make the sauce now in each large serving bowl. Divide the noodles and beansprouts amongst the 4 bowls with sauce. Mix the noodles, beansprouts and sauce well. Drop your meat and fishballs into the simmering soup. Place individual portions (one bowl) of the minced meat, meat slices and liver into a deep skimmer or heatproof fine sieve and lower it into the simmering soup and cook for 1 minute, stirring the minced pork/chicken with chopsticks while still in the soup to break the clumps up. Top the noodles with the cooked meat. Do the same with the other 3 portions. 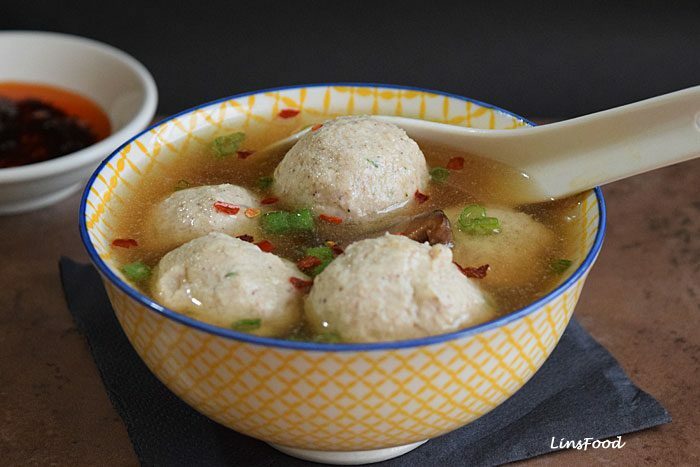 Scoop out the meatballs and fishballs out of the soup and divide equally. If you would like your noodles a little wet, add a ladleful of the soup. Divide the stewed mushrooms equally amongst the 4 bowls, topping the noodles. 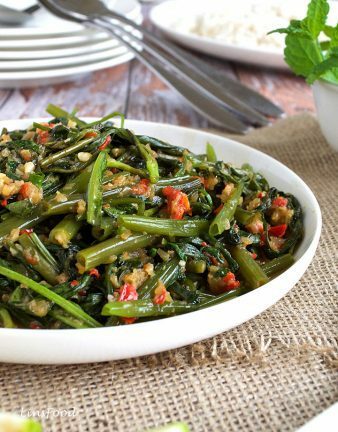 Garnish with the crispy toppings, spring onions (scallions), lettuce leaves. I like to serve the noodles with a bowl of the leftover, deliciously flavoured soup and some chilli oil on the side. Thanks for the recipe. I just tried it for lunch today and it was given the thumbs up by the whole family. 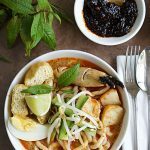 It is one of the many things we really miss about Singapore, and I have been trying various versions I found online – never successfully til now. Thanks alot! It may be the kind of dish you need to plan for but well worth it. 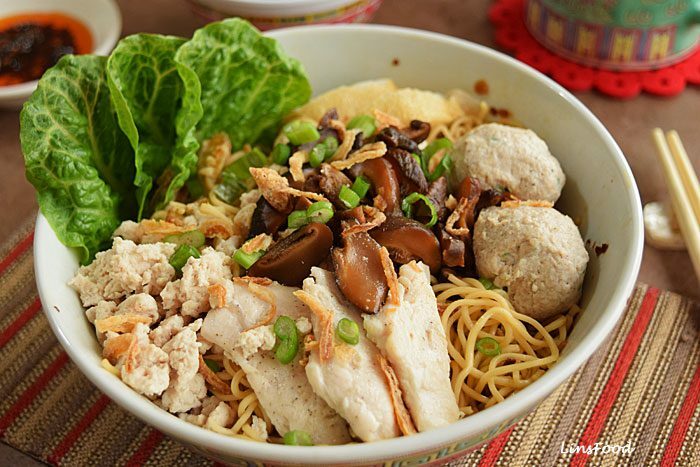 Hi Judith, I’m so glad to hear you finally made Bak Chor Mee to your liking! That’s always satisfying. And yes, you are right, it does take a bit of planning but it’s so worth the time and effort. Thank you for letting me know! Another favourite! This one looks so complicated though, doesn’t it? But I can see how you’ve broken it all up to make it easier. So this will be a 2 day project, from what I can see, so got to keep it for a special occasion, I think. Thank you, I am definitely going to try this, I really miss it, haven’t had it in so long! Yes, this one was a special request, and as you can see in the blog post, I mention that it took me forever the first time I made it 20 years ago! But yes, I’ve broken it down and tried to simplify the steps, so that you can make it bit by bit, then bring it all together. Yum! This looks and sounds delicious! It definitely seems like a labor of love, but I’m sure it’s worth it. Never knew they were called … hawker centres, but I always tell friends visiting Singapore to find them at night. They’re so alive, down to earth & better than fussy restaurants that are too cold for me. One of my favorite things when working in Singapore. Absolutely, I couldn’t agree with you more! My goodness, this sounds like an interesting recipe that needs a lot of work to do, but the entire bowl looks absolutely delicious and healthy. 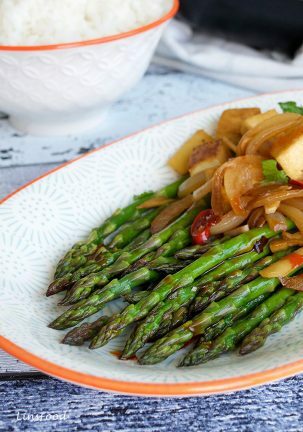 I love Asian dishes so much and this one is so inviting for sure! 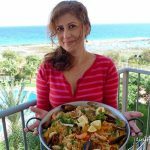 What a yummy recipe, This is the first time that I heard about this recipe and so glad that you share this with us. This looks delicious! 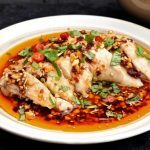 I love Asian style recipes! I would probably substitute the mushrooms, but everything else looks yummy! Oh yum I love noodles! Stewed mushrooms sound delicious added to them too, as do the other veggies. Does look really good. Like all the different ingredients. 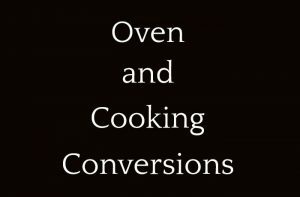 Would love to try your recipe. Yes I love Bak Chor Mee. 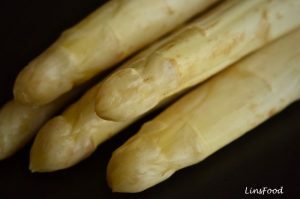 Had it when I was in Singapore several years ago, however have never prepared it at home. 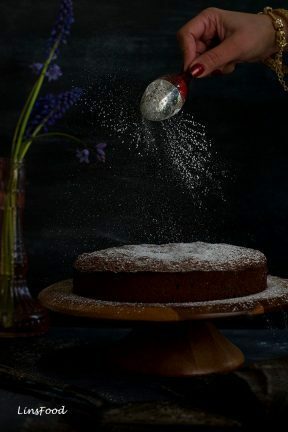 The recipe looks great and very doable. Bookmarked! That is pretty awesome. I love Asian dishes because they’re packed with flavor and they’re dishes are always pleasing to the eyes. This one is worth a try! This looks really good. I know that my hubby would love it. Thanks for sharing. That is one gorgeous looking bowl of food! My kind of meal, this! Yum! Oh! I would love to have a sip of it now. A noodle soup for this weather is all I need. OMG, I’m so excited! Just sent you an email! I’d love to see you experiment! 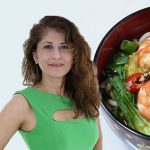 I have so many different Asian cuisines on my site. Oh yum, this looks really tasty! I don’t think I’ve ever tried anything like this before but I certainly would be willing! That sounds delicious. 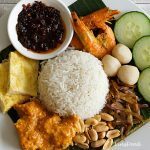 I have never had food from Singapore before, but I will have to try this soon. Thank you, Robin, Singaporean food is one of the best in the world! Sedapnya mee ni! This is one of the reasons I love your blog, Azlin! You always do a bit extra for the readers! 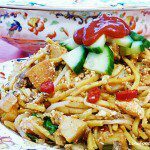 I am definitely going to be trying your halal Bak Chor Mee version! Thank you! Terima kasih, Rosmini, I totally appreciate you taking the time to let me know. Don’t forget to pop back in to tell me how it went! Yay, I’ve been waiting for this since your meatball recipe, which I made last weekend, by the way! I was telling my Canadian daughter in law about these noodles and sharing this with her! I think we’ll have to have some bonding time cooking this! Thank you! 谢谢! Wow, hearing from you twice in 2 weeks – must be a blue moon out there! Thanks Jenny, let me know how the MIL/DIL bonding session goes!